Where's the Horse for Me? Cindy didn't want to go to Colorado. But since her dad was on his honeymoon, this was the only place to go. Beth, her new stepsister, was with her, too. She was a sister that Cindy didn't want. When the two girls spend the summer together, they find out a lot about each other. They find out that sisters can be very special. 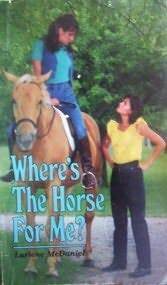 Used availability for Lurlene McDaniel's Where's the Horse for Me?